This split was another tape that was released as part of Cassette Store Day. Luckily I didn't have to figure out what a cassette store was and go in search of it out in that cold, cruel world. I was able to pick it up from the website directly. I grabbed this and the Chomp cassette from yesterday within a day or two from each other. Speaking of Chomp, I would discover when both tapes arrived the songs from Chomp on this split are both already on the Bruise Cruise cassette as well. My opinion of these two songs hasn't changed since yesterday. They're both pretty awful. After posting my review of the Chomp cassette yesterday I went back and re-listened to their older full length to see if I was giving them a hard time without reason. I can assure you I was not. The Buddha Jabba Mumma album is still fantastic, no clue what happened to these guys in the mean time. Luckily on the flip side is Herzog. They have stayed true to the spirit of their last album and haven't disappointed me one bit. Their nearly ten minute long opus "Slow Days / Arizona" is just a fantastic little slab of great song writing. As the title suggests, it is essentially two different songs that are joined together by a little intermission meandering in the middle. Both sections of the song are stuffed with catchy guitar riffs, soaring harmonies and all of the early-Weezer-filtered-through-a-garage-band goodness that I've come to love about this band. 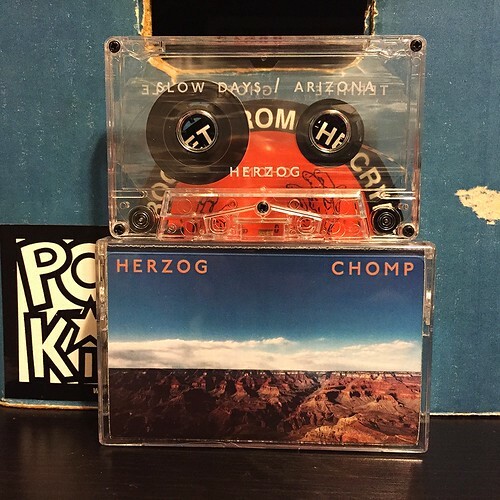 I may be off Chomp at this point, but I am counting down the days until a new Herzog record.